If you have a coupon code, type it here and then hit Enter. If your code is accepted, a discount pay button will appear below. Your average University professor thinks that all you need to become a successful engineer is learn how to parrot a bunch of meaningless equations on paper. Your average university professor is WRONG. You know this is true if you've ever shown up at a new job or internship and realized you have no clue what is going on. You need to put your hands on real machines and make real stuff actually work. That's how you learn the MEANING behind the equations, and that is what gives you power. That's how you become an engineering guru. Employers know this. That's why so many of my former students have gotten job and internship offers just by carrying around the things they built with this kit. If you are serious about your engineering dreams, you can't afford not to do this. 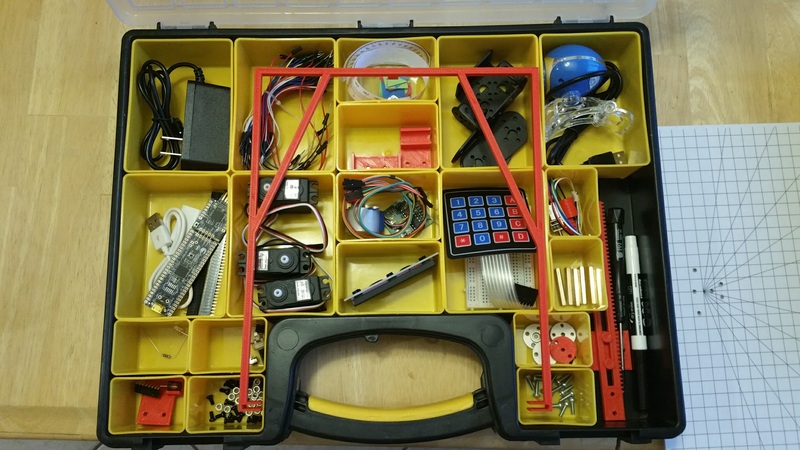 The kit includes a PSoC 5 microcontroller, five actuators, and more than 50 other electrical and mechanical parts to construct robot manipulators and devices of many different types and practice a whole year's worth of University-level robotics knowledge. This ain't no Lego robots kit. This kit is only for serious engineering students who want to know what the hell they are doing. If you are registered for EGR 455 or 456 at Arizona State University Polytechnic Engineering, then you are required to buy the kit for class, but you get an amazing discount due to the fact that you are also paying thousands of dollars in tuition just for the privilege of taking this class - it will only cost you $95. Don't enter a shipping address; I will bring your kit on the first day of class. If you are not registered for EGR 455 or 456 at ASU Poly, you are still welcome to buy the kit and work through the curriculum on your own. The curriculum is totally free for you. The kit costs $395 plus $10 shipping anywhere in the US, or $100 shipping anywhere else in the world.